A new economic impact report released by Lt. Gov. Sue Ellspermann and the Indiana Office of Tourism Development documents the growing impact tourism has on the Indiana economy. The report shows travel, tourism and hospitality continues to be the sixth largest industry in the state (excluding government), supports over 187,000 jobs and contributes $10.3 billion in revenue to Indiana businesses. This is the second consecutive year tourism’s economic impact was measured. This study used data from 2013; the most recent year complete data was available. In 2013 the travel, tourism and hospitality industry was responsible for 1.5 percent of total Indiana gross domestic product (GDP), 4.7 percent of total jobs in the state and 6.3 percent of state & local tax receipts. The study shows measurable growth over 2012; a year buoyed by Super Bowl XLVI, a seminal event for the state. Total Indiana tourism spending in 2013 of $10.3 billion (an increase of $200 million over the previous year). 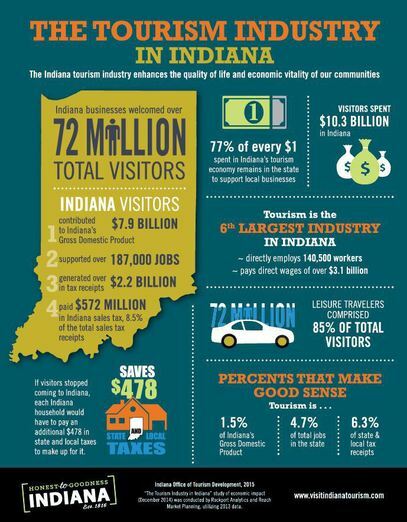 In 2013 visitor spending translating to over $7.9 billion in Indiana GDP. Leisure travelers comprised 85 percent of total visitors. Direct employment within the Indiana travel, tourism and hospitality industry eclipsing 140,000, making it the sixth-largest industry in the state (excluding government). Indiana tourism generating over $2.2 billion in tax receipts. Indiana visitors contributing $572 million or 8.5 percent of sales tax receipts. Tourism paying direct wages of over $3 billion to industry employees. Indiana retaining approximately 77 percent of each dollar spent by visitors. The study was commissioned by IOTD and conducted by Rockport Analytics, an independent market research and consulting company that specializes in economic impact and feasibility studies for the travel, tourism and hospitality industry. The methodology employed by this study is in accordance with industry best practices and aligns economic impact data at the state and local level with rigorous methodological standards that are recognized as the highest in the industry. The study used data on Indiana visitor spending derived from multiple sources including Longwoods International, Reach Market Planning and U.S. Office of Travel and Tourism Industries. It was then reconciled with Bureau of Labor Statistics reported employment data, Indiana Department of Revenue reported tax receipts and secondary sources such as Smith Travel Research. The attached infographic offers context for some key data points in the economic report. This year’s complete study, as well as last year’s information for comparison purposes, key travel indicators and other information related to the tourism industry, is housed on the Indiana tourism industry website VisitIndianaTourism.com.